Hey, hi and hello! 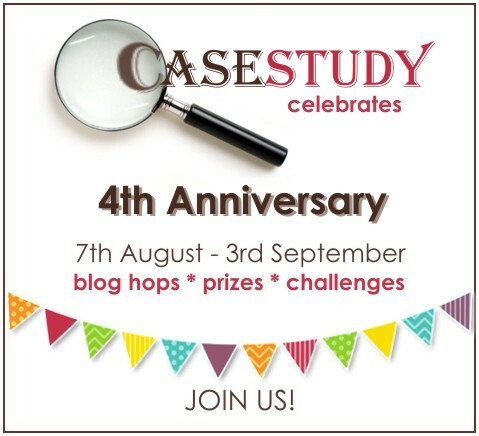 Welcome to my stop on the CASE Study 4th Anniversary Blog Hop! Can’t believe it’s been 4 years! Congratulations to Chupa and the whole team. YAY! There’s an amazingly talented group hopping today! It’s quite an honor to be among all these former muses! In case you were wondering, I was the muse for June of 2013 and you can check out my posts here. It was so fun! There’s also a challenge opened for all to play along. You are invited to CASE any one of the projects featured in the blog hop. Check out the CASE Study blog for more. Now that the bookkeeping is out of the way, on to my cards! I have two to share with ya today with our theme of “inspiration”! 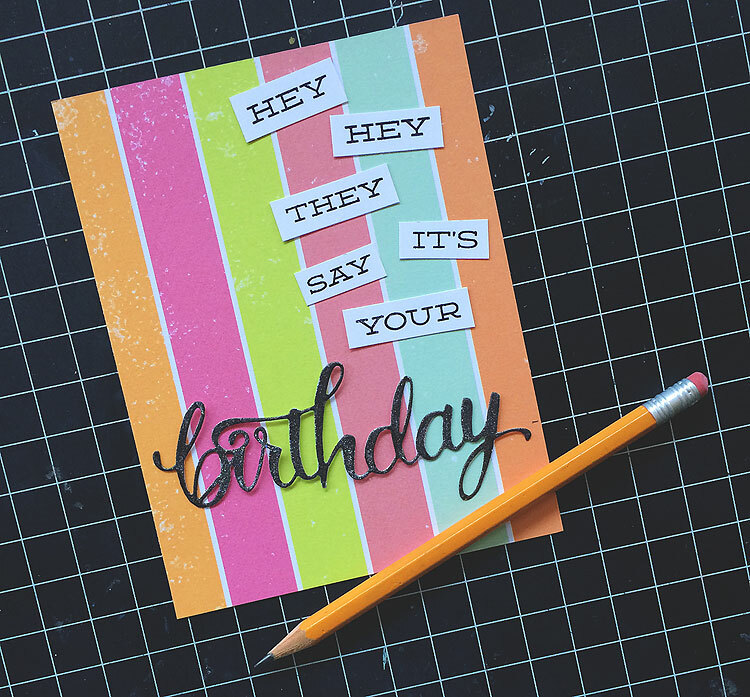 Card #1: Hey Hey They Say It’s Your Birthday! At first I was thinking of cutting a strip of paper and then offsetting the stripes the way it is on here. But then I spied some Studio Calico paper from the Hello Hello Scrapbook Kit that I had sitting on my desk and the white stripes lined up perfectly when I flipped the paper around! So it just had to be done that way instead — it’s like it was meant to be! I can’t wait to try another card inspired by this pin someday — soon! 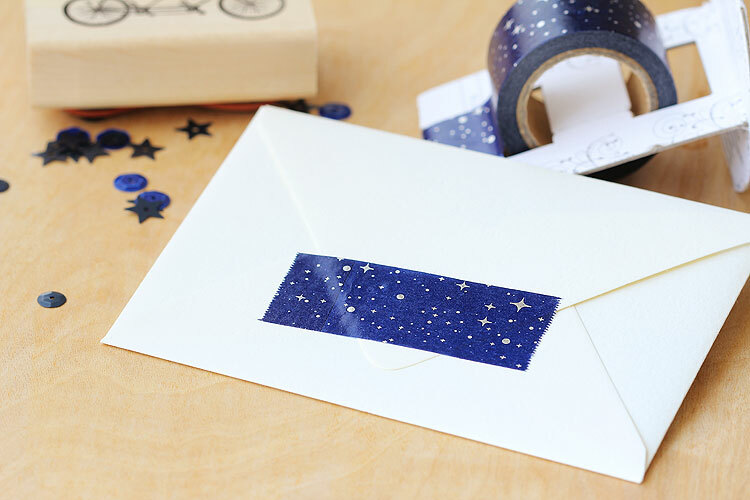 I’m thinking of trying a gold misted stencil and making the dots out of washi tape. Or tissue paper. Or sequins. The list goes on. Wish there was more time in the day! Now for a bit more about the card. 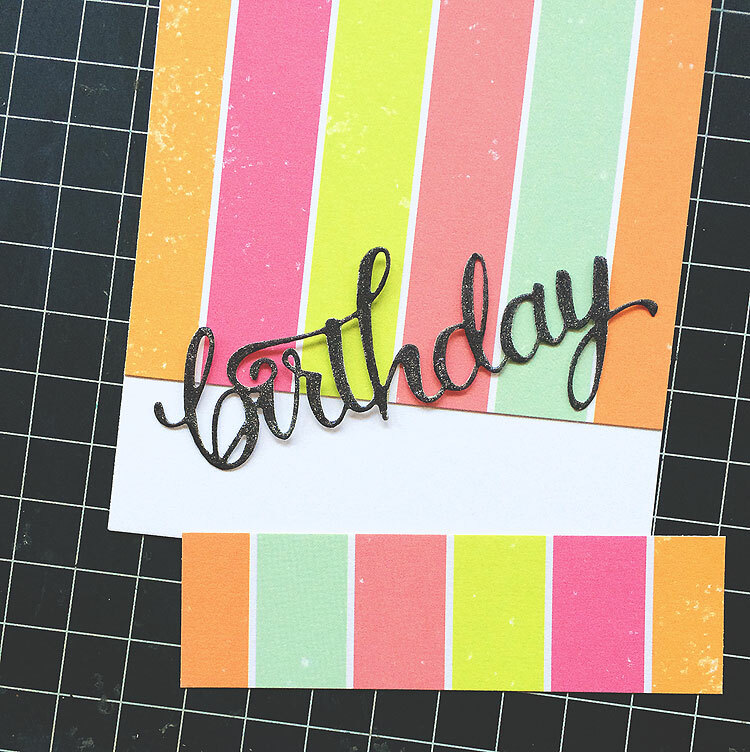 The birthday is a die cut that comes with this stamp set from Studio Calico. I cut it out of silver glitter paper but it didn’t pop enough, so I grabbed a black Copic marker and colored over it. Perfect. Then I made a mark with a pencil so I’d know where to cut the paper. Next I adhered the top piece of paper to a white card front, then I flipped the strip around and adhered it too. After that I just adhered everything in place. 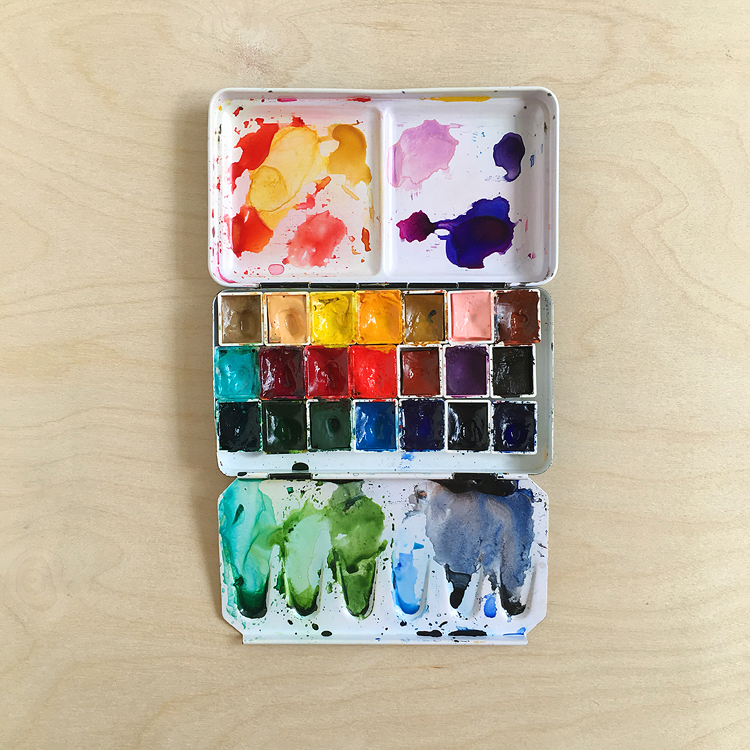 Love having a photo of what I was planning — can’t tell you how many times this has saved me after I’d been interrupted or had to stop working on a card for the day. No more scratching my head going what was I thinking again? Ha. 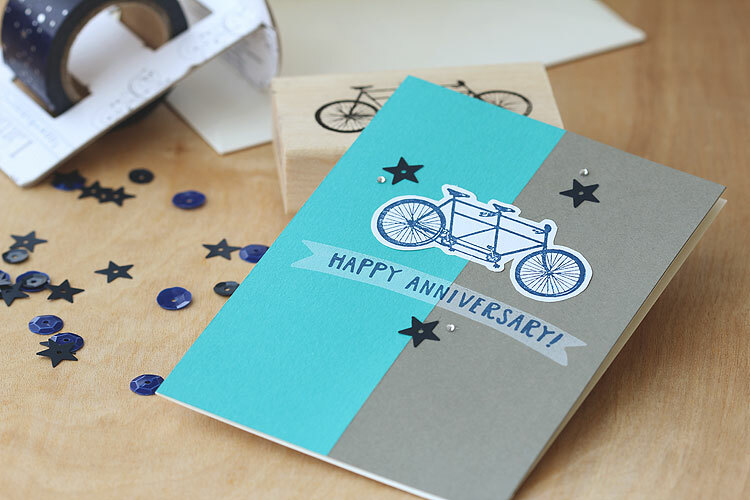 Card #2: Happy Anniversary to J! Next up, I needed an anniversary card to give to J! August 15th will be our 17 year anniversary together. And I love him now more than ever. Enter this tandem bicycle stamp that just I had to have when I spied it at Paper Source. 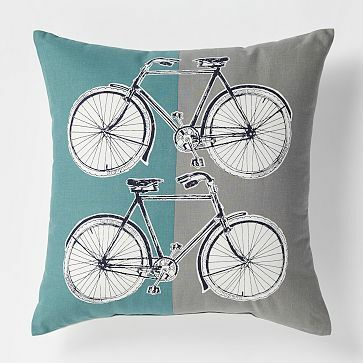 For this one I was inspired by this bike pillow from West Elm. It’s discontinued now, bummer! But it lives on over on my pinterest board. I really like bikes. A ton. I own three real bikes — not to mention my collection of bike stamps lol. So I’m always on the lookout for fun ways to use my collection of bike stamps. 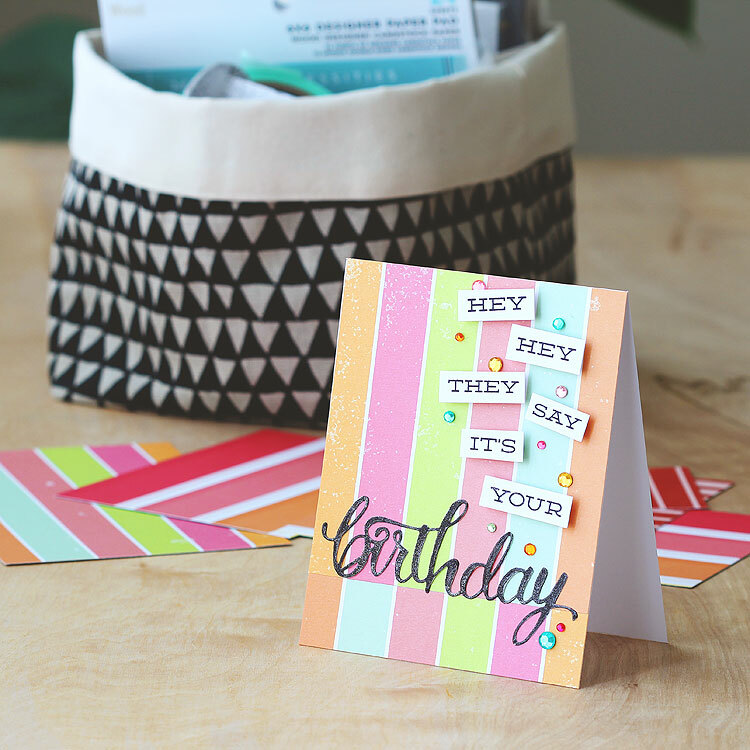 The cardstock is also from the Studio Calico Hello Hello Scrapbook Kit — the same kit that has the striped paper — it’s like this card was meant to be, too! 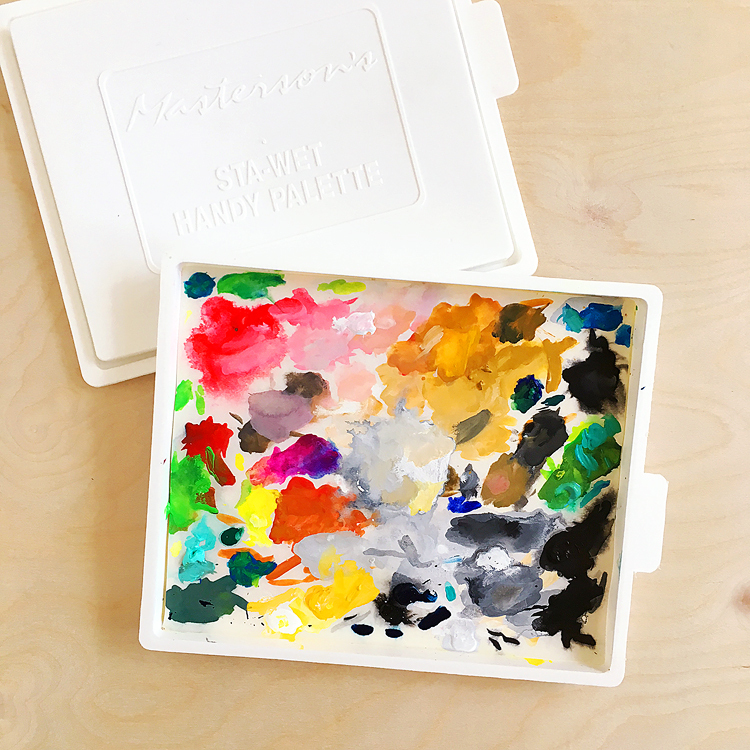 The stamps are from the Studio Calico Camelot Card Kit — love this kit so much. 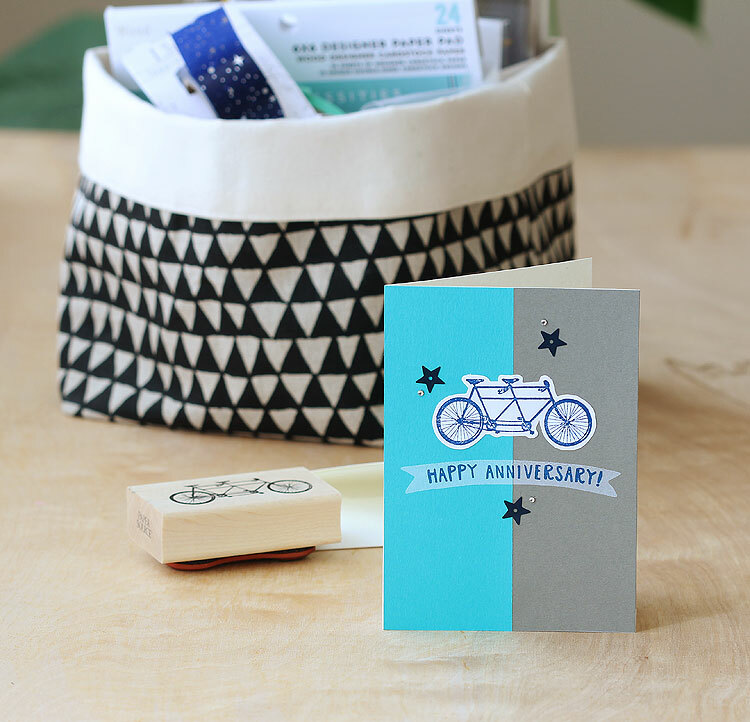 The happy anniversary message was stamped with Studio Calico deja blue ink, and the banner was stamped in Hero Arts unicorn white. One tip I wanted to pass on here is that I ended up stamping the bike on printer paper/copy paper instead of cardstock. Then I adhered it in place with a gluestick and really burnished it on there with a bone folder. I think this makes it look more like it’s printed on the paper. I finished it up by adding some Studio Calico star sequins in navy to go with the ink and some gems from Hero Arts. I might go back and add a few more gems later. On the inside I plan to write “I love you more than all the stars. And bikes! And that’s saying alot.” Still can’t believe we’ll be married 17 years. Time really does fly when you’re having fun! Oh and! I wanted to share this pretty washi tape I picked up at Paper Source the same day I got the bike stamp. It’s from Little B designs and it has metallic silver stars! So cool. 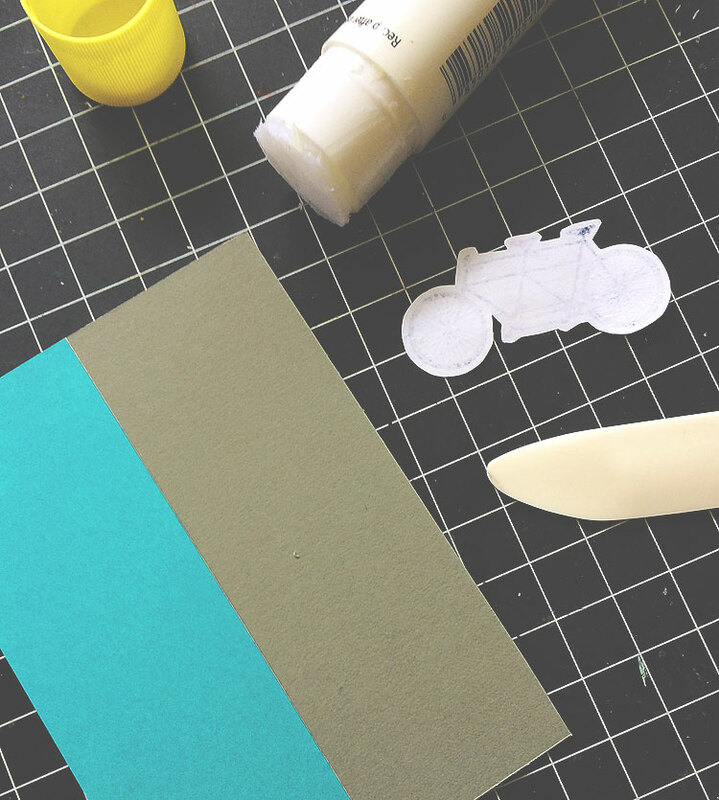 It also has a built-in cutter — genius! Okay that’s it for me today! Hope I gave you lotsa ideas and inspiration. I’m the last stop on this hop, so if you’re just joining us check out my list at the top or click on over to the CASE Study blog. 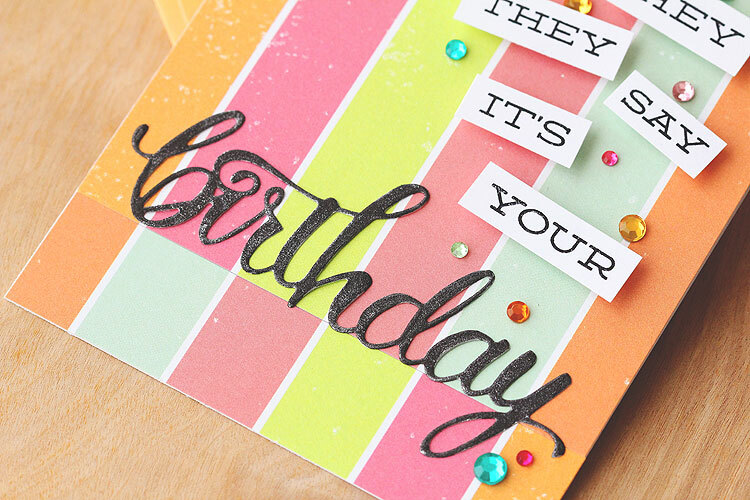 Online Card Classes Stretch Your Stamps 2 Giveaway! Super genius way to make backgrounds. I especially love the first. I’ll be singing that song all night! Love both cards, and love how you did the background on the first…too cool!!! Very cute and very clever on the bike card. The first card is really festive!